Network Oil & Gas (NOG) was formed in Sweden 12 years ago. It is a forum for training, exchange of experience and debate on issues that affect the use and significance of fossil fuels. During a year, NOG aims to organize approximately six symposia. Last Monday’s seminar was titled, “Perspective on future oil use” and was the 69th to be held. I was most recently invited to deliver a lecture for NOG in 2004, but as early as 2001 I was invited to present at one of their symposia that they had organized to examine the extent of public interest in issues regarding oil and gas. Last spring it was discussed that I would be invited to present a lecture on my book “Peeking at Peak Oil.” During the summer, Staffan Riben, the chairperson of the program committee and the moderator of the symposium read my book. He has significant experience in the oil industry, and I was very glad when he began his introduction by saying that he liked the book, had even learned something from it himself and that he recommended that people who wanted to know about oil issues should read it. At symposia usually, they also invite someone who has a different view on issues to that of the introductory speaker. I felt honored that the person chosen for that role was Eirik Wærness, chief economist for Statoil and the person responsible for Statoil’s annual publication “Energy Perspectives” that gives outlooks on supply and demand to 2040. Eirik Wærness is also a board member of Norges Bank (“Norway’s Bank”) that is the central bank of Norway. That bank has, among other things, responsibility for the Norwegian Oil Fund. I will return to the Fund later. 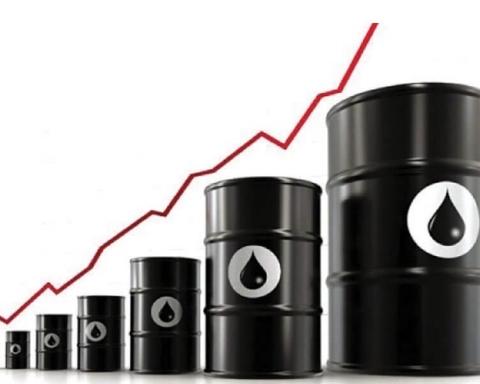 “Producible crude oil resources are not infinite, but demand for energy is continuously growing. Are we headed for a crisis where production cannot satisfy demand, with rising prices as a consequence? 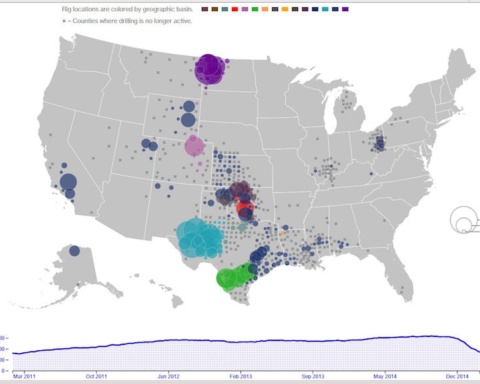 Existing oil fields are inexorably emptied, and this is only partly compensated for by new discoveries. 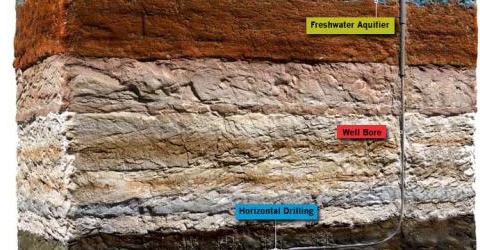 On the other hand, technological progress and rising prices have meant that so-called unconventional resources, oil sands, and shale oil, have now become reserves. Higher prices are also restricting demand and stimulating the more efficient use of energy. Demand for energy is driven primarily by economic growth while, at the same time, access to energy is a precondition for that growth. The world’s economy is expected to grow but with declining energy intensity. Access to renewable sources of energy is increasing, a development that is driven by political policies. Similar comments were made by Göran Persson when he was prime minister. If one studies the change in energy supply that Sweden has seen from 1970 to 2010 we see that in 1970 we used 368 TWh of oil and coal and that by 1990 consumption of these had decreased to 230 TWh of oil, natural gas, and coal. Except 2009, energy supply has been approximately constant at 230 TWh since 1990. Regarding carbon dioxide, these emissions have shown a similar pattern. There has been no reduction by 20% from 1990 to 2010. However, compared to 1970 we currently produce 37% less emissions while compared to 1980 the reduction is 24%. 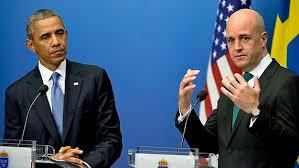 I think that Prime Minister Reinfeldt cited the wrong set of years in his speech. For economic growth, Sweden’s central bank states that we have seen approximately 2% per year since 1970. From 1990 the approximate total value is 55% with 60% a more likely true total. If we use 1980 as the starting point, then we have seen the growth of almost 90%. Regardless of what numbers are correct, Sweden has seen growth without increasing emissions of carbon dioxide, and Prime Minister Reinfeldt takes this as evidence that there are no conflicts between economic growth and protection of the environment. Here we see that energy use for transportations has grown by 74% since 1970. The renewable portion has grown from 3% to 6%, but the largest proportion of the increase since 1970 is from oil. It is interesting to note that during 2009 we had “negative growth” and that oil consumption also decreased but it returned to “positive growth” in 2010. The conclusion is that Sweden would not have seen growth since 1970 if we had not simultaneously had increased oil consumption for transportation. The coupling between growth and increased emissions from transport is very clear. In WEO 2012 the IEA completely hedged its bets for 2035. They gave prognoses that vary all the way from 108 Mb/d down to 79 Mb/d. What they call their 450 ppm prognosis is closest to the latest prognoses from Colin Campbell. For prognoses, Statoil presented its most recent future scenario in June and noted Peak Oil in around 2030. I will return to this when I discuss Eirik Wærness’ presentation. To discuss everything that I described on conventional oil, unconventional oil, on fracking and many other things would take a long time. Instead, to represent the conclusion of my presentation, I will satisfy myself by discussing this image from my book. From 2004 to 2010 oil production was relatively flat and during that same period, the oil producing nations increased their internal consumption. 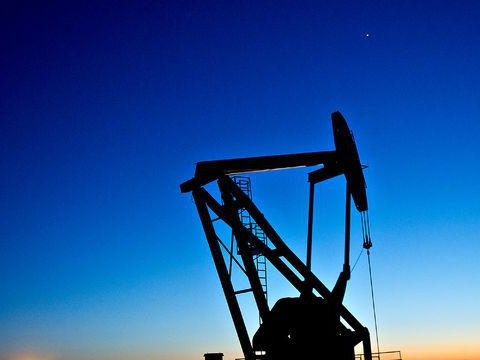 It meant that the volume of oil available on the world export market decreased. At the same time, we see that China, India, and South East Asia increased their imports. It means that the OECD nations and the rest of the world decreased their imports by 15% up to 2010. The trend that we have seen in Sweden of decreased oil use outside of the transport sector is now a trend in the rest of the OECD, but the fact is that we have now also seen the transport sector decrease its fuel use. For growth within the OECD, this is a negative influence. If the trends continue, we can expect even less oil use by the transport sector by 2020. The question is how much can we increase energy efficiency? The message is that we must invest in alternative fuels to oil if we want to see future economic growth. The intensive investment we are making into wind power without investing in alternative fuels for the transportation sector may be counter productive. As I mentioned earlier, Eirik Wærness is the chief economist at Statoil and responsible for their publication Energy Perspectives – with predictions for demand and supply to 2040. He began his lecture by noting that he was an economist and that I was not and he meant by this that some of my assertions could not be correct since they were made outside of the framework of economics. I remember that, a few years ago, I used to have an image in my presentations showing that the predictions of economics violated the laws of nature and from the emphasis that Eirik Wærness put on his comments it is clear that he thinks that the laws of physics are subordinate to the laws of economics. His run-through of Energy Perspectives followed the published report quite carefully so if you are interested you can read that. 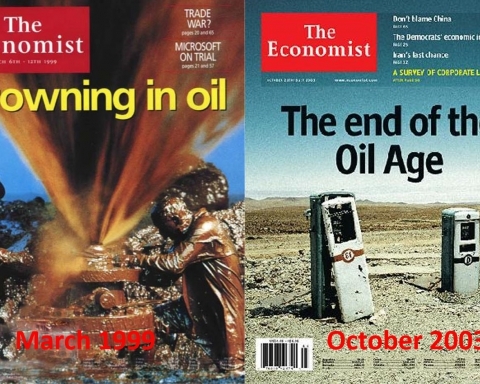 It is important to note that, as an economist, he discussed “demand” with Peak Oil demand occurring around 2030. For him, it was unthinkable that this peak could be due to resource shortage. 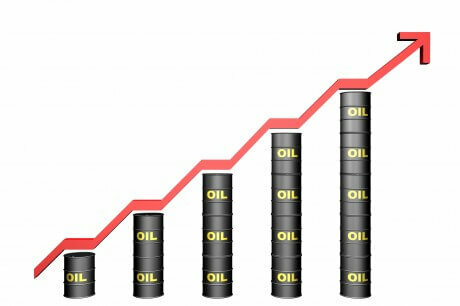 If there were an increased need for oil, then it would not be any problem to produce more. I asked him whether the peak in Norway’s oil production depended on there not being sufficient buyers for Norway’s oil i.e. insufficient “demand” for it. He looked at me a little wonderingly but did not give a clear answer. In some way, this was not relevant to the fact that global Peak Demand would occur around 2030. There was a small peak in world oil production around 2008, and we know that the decline in demand in 2009 was due to the economic recession that the world experienced. 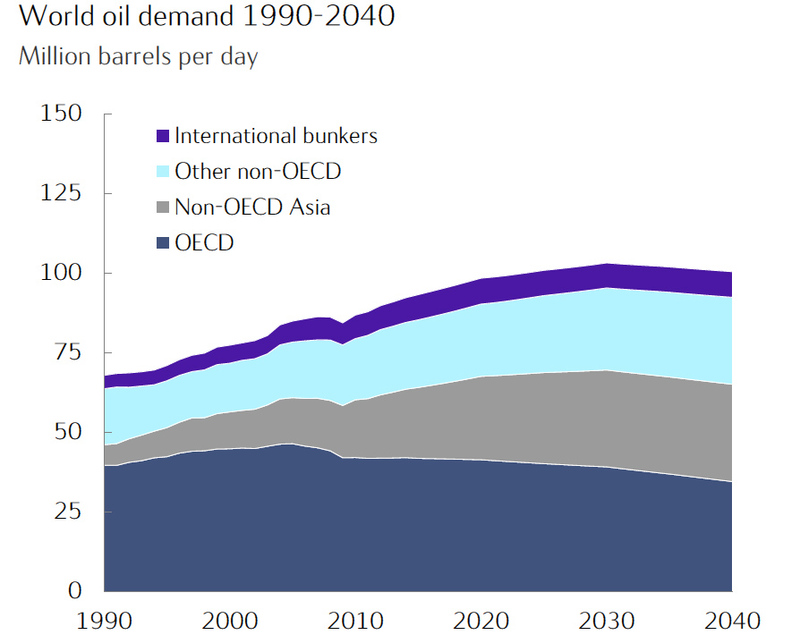 If the peak in demand in 2030 that Statoil focuses on was to be a reality we could interpret the predicted peak and subsequent decline after 2030 as a warning on the future decline in the global economy. At the moment we can use India as an example of where the economy is collapsing and where oil consumption is also decreasing rapidly. Eirik Wærness is, of course, also a board member of Norway’s central bank and part responsible for the Norwegian Oil Fund. He mentioned that the Fund is now so large that it is the equivalent of every Norwegian owning one million Norwegian crowns/kronor. It was discussed that the investments they are now making in various companies would lose value compared with letting the oil remain on the ground. He felt no concern regarding this. NOG will release a written report regarding the symposium and will also make our presentations available. I do not know when this will occur, but I will make a note about it. I was very pleased with the fact that 110 people had reserved a place at the symposium and someone said that it was only Foreign Minister Carl Bildt that ever had attracted a larger audience.